Actually it feel good when you start your old life to slowly move on to the new phase of life.. Yesterday when I was writing the post I had nothing in my mind what has happened to me in the past, everything was looking like before, how I use to start writing the post as soon as my husband leaves to office.. That feeling itself gave me lot of positive energy. So from now on I have decided I will not be giving more pain to people around me being sad and I will start writing on my blog what I feel, I'm not a writing person but it really feels good when you write about what you feel.. Cutting of from the world it is not a right solution to me, I really need to face what ever come on my way and wait till everything again falls in a right place, as everybody says I will get back what I have lost... Now lets come to the recipe. 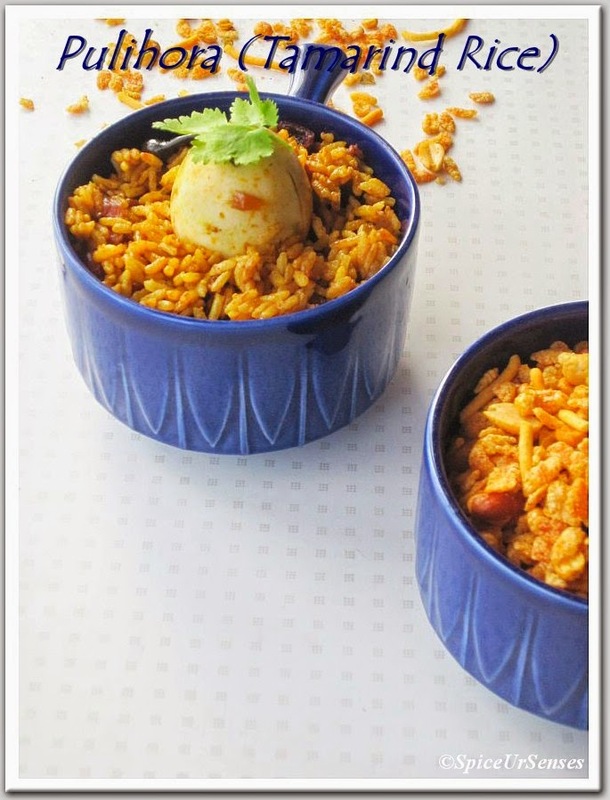 Pulihora is something very common dish in South India. They cook this dish on many occasion. Such as Marriage, Festivals and Pooja. But some of the people don't use onion and garlic to this. 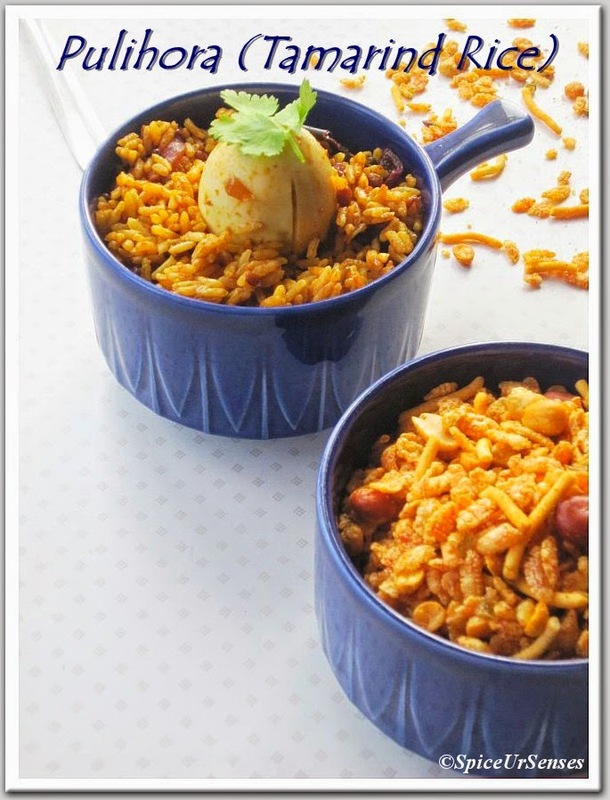 This rice is favourite of all in my family, I cook very often and I try out many ways so that you are not eating same every time.. 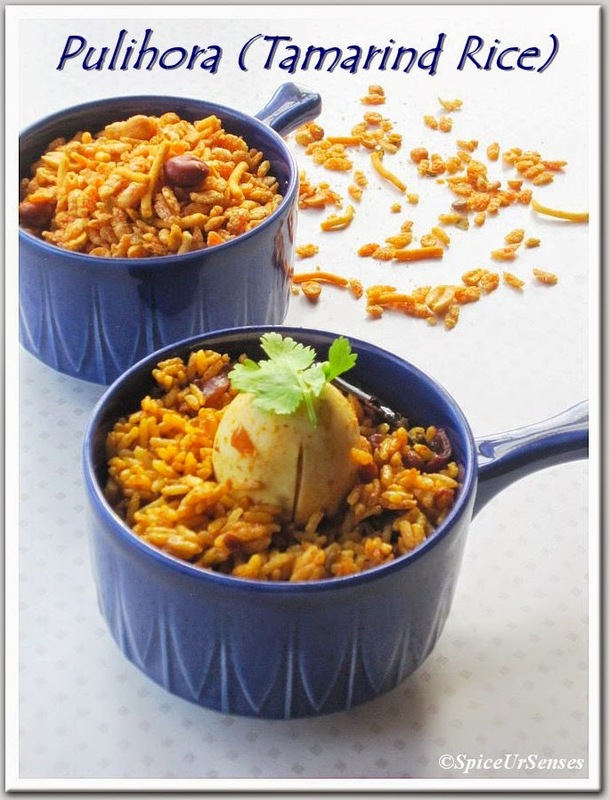 I have already a post of tamarind rice in a different way and this one among the many pulihora what I cook.. It goes very well with a boiled eggs and coconut chutney.. In deep kadai/frying pan, add oil, when it is hot add peanuts, channa dal, urad dal, crushed garlic and fry to lite golden brown. Then add mustard, dry red chilli and curry leaves. When they splutter, add onion and fry for 2 to 3min. Add red chilli power, turmeric, coriander powder, tamarind paste and salt with a 1/2cup of water and allow the mixture to cook till it becomes thick. Now add the rice and mix well. This rice can be served cold or warm. 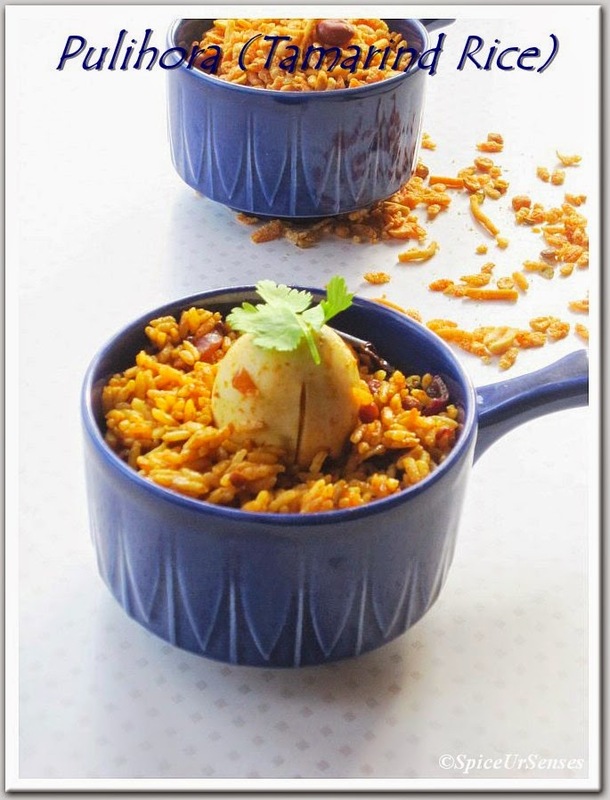 Serve with boiled eggs and coconut chutney. My favorite rice, start visiting others too, u will feel better too. the rice looks yumm ..take care dear..God bless you.. Hoping God gives you all the love and comfort... the rice looks yum ! 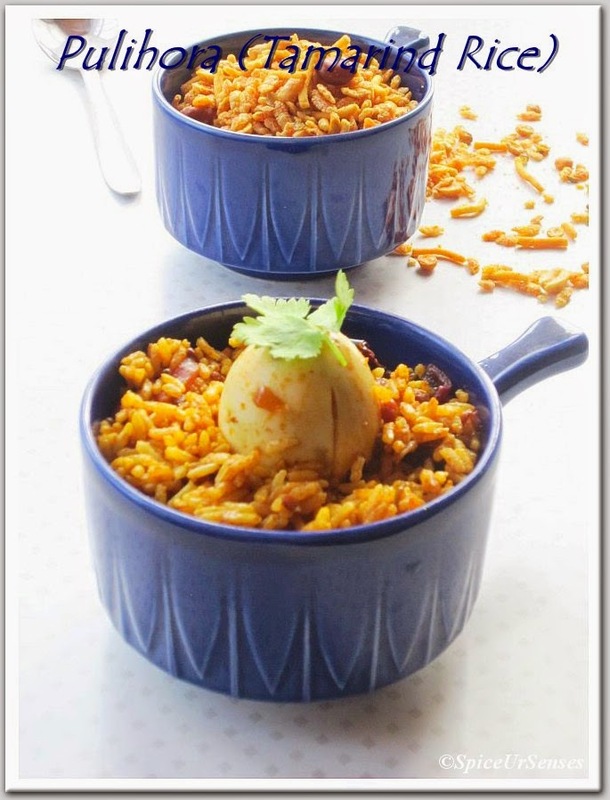 Great recipe and nice to see you back to blogging. Dear, I have been through all this, I know everything seems to be so bleak now, but trust me, miracles do happen like with us, we were blessed four times for the one that we lost. Please don't lose hope and keep what you are doing now. Take care and my hugs are prayers are with you.